Everybody’s called it. Everybody’s contested it. Everybody’s also eaten it, played games with it, read about it, and even bought chocolate milk with it. Dibs is more than a quick way to stake a claim on something, it’s an old word with some surprisingly twisted origins. Dibs appeared in English texts as early as 1578, back when English was barely English and Shakespeare was a moody teenager writing poetry on Livejournal. Its meaning had nothing to do with calling a claim on anything, however. It was simple transcriptions from Aramaic, Hebrew and Arabic texts, all of which had words that sounded similar to dibs in European ears. Going back a bit further we suddenly find ourselves stepping into biblical territory. Here, 2,000 year old writings make regular use of the word dibs, uttering it almost as often as we do today. It’s in an entirely different context, though, so no one gets to read about Jesus calling dibs on the best pair of water-walking sandals. The biblical dibs is disaapointingly mundane, derived from the Hebrew word dvash (×“×‘×©) and the Arabic dibse, both meaning honey. Dvash puts the kibosh on dibs as far as we’re concerned, but it also turns over some interesting biblical stones. When you see the word honey in the Old Testament, it was translated from dvash. But dvash doesn’t specifically mean “that sticky yellow stuff bees vomit out and people eat”. Its definition includes a variety of viscous, sweet liquids, especially fig syrup, date syrup and wine syrup. According to Balashon, the Torah uses the word dvash 55 times. All but two of those refer to non-bee honey. Off to the conspiracy forums to get that discussion rolling! After ditching the sticky subject of bible honey, we have to move ahead several centuries before we find dibs attempting to kickstart its new career. Linguistic theories on how the word took root are shady, meaning we don’t have a definite origin pinned down and most likely never will. We do have some solid theories, however, and one of them involves sheep knees. 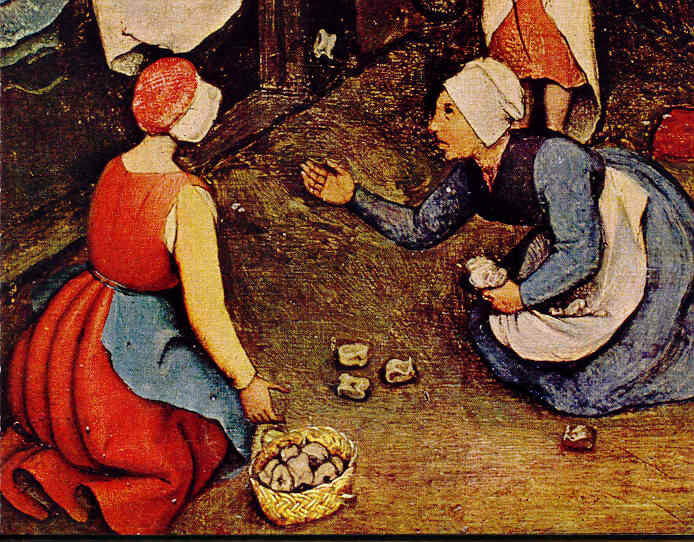 In 17th century England a little game known as dibstone was gaining popularity. Since Tetris was a few hundred years away, kids those days had no choice but to take to the streets with handfuls of pebbles to make their own entertainment. The result was the game we now know as Jacks. The theory is the act of “dibsing” stones in this game leaked into everyday life, just like we quietly whisper “Yeah, Tetris!” to ourselves when stacking canned peas in the cabinet. Another possible origin for dibs comes from early 19th century Scotland. 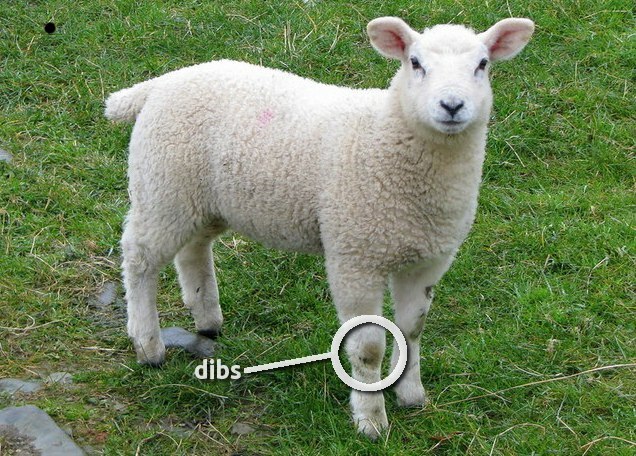 A dib back then was a small bone taken from the knees of a sheep or lamb, also called a huckle bone. These were often used for gambling, which may have had a hand in the “to claim” meaning, but they also worked their way into children’s games. A little more disgusting than stones on the street, but the olden days were weird, weren’t they? “Brush with the dibs” – Abscond with the cash. “Tip over the dibs” – To pay down or shell out. “Come down with the dibs” – To fork over money for something. “Flash the dibs” – The 19th century’s version of “make it rain”. To round out the dibs theories, some linguists have suggested the word comes from a shorthand version of divide used in the north of England in the 1800s, a simple shortened version of the word divvy, and a loan from the Yiddish phrase “fin dibsy”, which means to lay claim on something. With all the murky origins safely in the past, dibs finally became the word we love today in 1932, though it isn’t the happiest of tales. The Great Depression was bearing down on the United States, and families across the continent were struggling to survive. The phrase “dibs on the core”, used to claim the leftovers when someone was munching on a piece of fruit, came into use, calling back the old dibstone meaning from a century before. It seems to have spread into the vernacular at that point, but we don’t see much printed use until a 1975 novel by John Watt appeared with the title Dibs on the Core. Apple cores, sheep knees, bee barf and money all had a hand in keeping dibs alive over the years. It wasn’t until the Great Depression that people felt the need to call dibs on everything they could, pushing the word out of the history books and into common use. The early ’90s kicked off some seriou dibs usage, and number of written instances of the word has been steadily increasing ever since. Either a lot of people are talking about biblical-era honey, or there’s a whole lot of claiming going on.